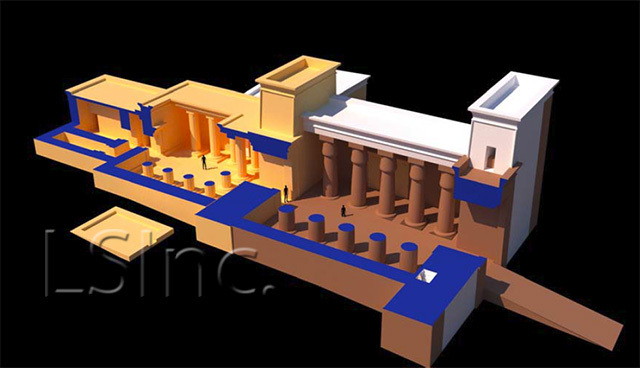 The Great Temple of Amun of Napata (the ancient Nubian national god), Temple B 500, was the largest temple ever built in Nubia, with an overall final length of 156m. It did not reach that extreme size, however, until the reign of the 8th-century BCE Kushite king Piankhy, who completed its hypostyle hall (502) and added its outer court (501). His additions enlarged by two-thirds the original temple, which had been built in at least six stages by the Egyptian pharaohs from the mid-18th to the 20th (possibly even 21st) Dynasties (ca. 1446-950 BCE). B 500 was the chief center of Amun's worship and royal coronations in Kush, at least during the Kushite period. 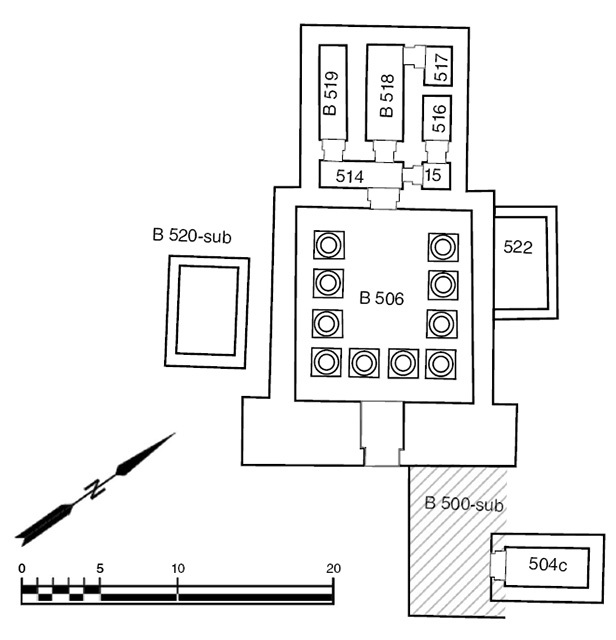 The earliest remnant of a temple within the ground plan of B 500 is a fragmentary mudbrick foundation, called "B 500-sub," which was discovered under the late-18th Dynasty stone pavement in court B 503. What remains of this structure is assumed to be a fragment of the first Amun temple known to have been built on the site, which was ordered by Thutmose III (1479-1427 BCE) shortly after his military occupation of Jebel Barkal, about 1446 BC. The king mentions this temple in his Jebel Barkal stele (now in the Museum of Fine Arts, Boston), where he called it Amun's Resthouse for Eternity. Ten phases have been identified in the stone construction of B 500. 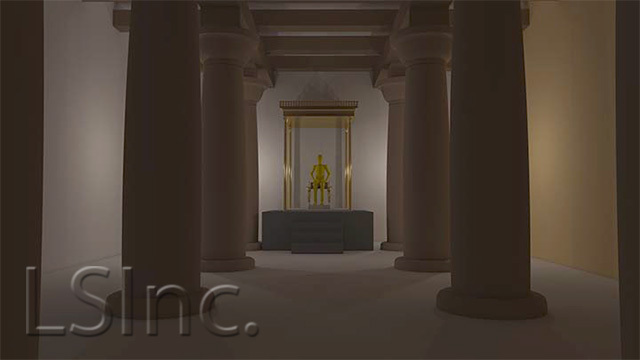 The 3D digital model of the Great Amun Temple (B 500) by LEARNING SITES is based on the excavated evidence uncovered by the Museum of Fine Arts, Boston, and new fieldwork and interpretations by Timothy Kendall, under the auspices of the Sudan National Corporation for Antiquities and Museums. B 500-Phase I is the first stone phase of B 500 and the first whose remains are actually visible on the surface. The structures of Phase 1 were built entirely with the small brick-like stone blocks known as talatat (widely used in Egypt, and normally one Egyptian cubit (about 52.3 cm) in length by 1/2 cubit (26 cm) in width). Since they were invented and used mainly by Amenhotep IV/"Akhenaten" (ca. 1352-1336 BCE), with only brief later use by his immediate successors, the blocks' presence here allows us to date B 500 Phase I fairly precisely to the late 18th Dynasty. B 500-Phase II is believed to be the temple rebuilt for Amun after Akhenaten's death by his presumed son Tutankhamun (1336-1327 BCE) and his successor Horemheb (1323-1295 BCE). Phase II consisted of a new open court (503) and forward pylon built with white sandstone talatat blocks. Elaborate papyrus-bundle columns were introduced in the outer court during this construction phase (the columns lower portions were found still in place under later floor levels). Seti I (ca. 1294-1279 BCE) of Dynasty 19 seems to have been responsible for eliminating the Phase II porticos in the outer court, replacing them with two rows of five massive columns, and bringing an end to talatat construction techniques during what is known as B 500, Phase III. The formerly open outer court was roofed on two sides while remaining open over the central aisle. Seti I seems also to have increased the width of the front pylon and added, on the northeast side of court 506, a large second sanctuary complex. 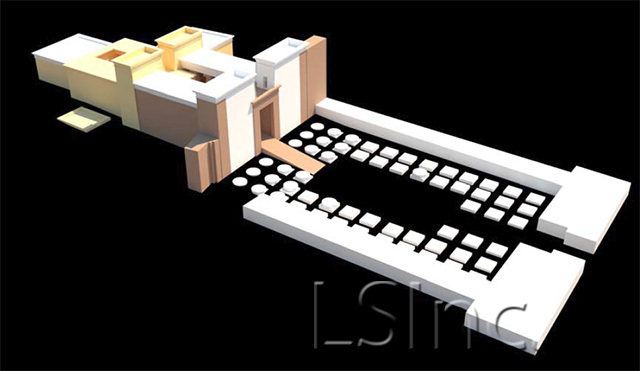 During B 500-Phase IV significant modifications to the temple were undertaken probably by Seti's son Ramses II (ca. 1279-1213 BCE). The front pylon was widened and a huge unfinished hypostyle hall of between 56 and 60 columns, was built in front of the Phase III temple, in what later became court 502. The construction of this hall, which was planned to have a stone roof, was probably begun late in Ramses' reign and halted at his death. Not one of the columns was built higher than its foundation or circular base. Had it been completed, however, it would have doubled the size of the old temple to 104m (equivalent to 200 Egyptian royal cubits). B 500 Phase V took place during Dynasty 20 (ca. 1187-1064 BCE), when minor additions continued to be made to the Phase III-IV temple. Two porches, for example, were added to the northeast side of the temple, and porticos shading the rear side of the first pylon and the front of the second pylon were added over the center aisle, which was repaved in white sandstone. The last known Egyptian addition to the temple may have been a small chapel sponsored by the Theban High Priest of Amun (later "King") Menkheperre (ca. 1045-992 BCE) of Dynasty 21. Not until the rise of the Kushites was new construction again undertaken on B 500. Piankhy's (ca. 747-716 BCE) extensive repairs and additions encompass Phases VI and VII. During this time, B 500 was heavily renewed internally, encased in a new outer wall, and provided with a throne room (B 520) containing a massive black granite thronebase. 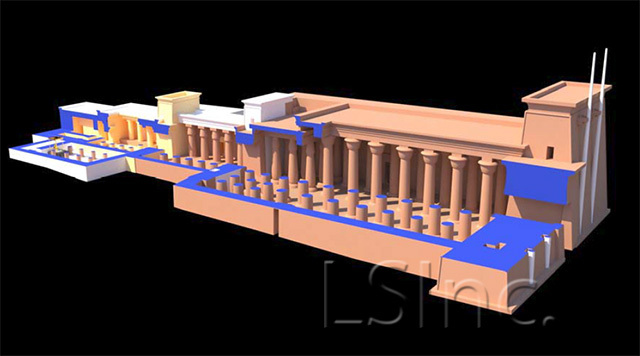 Piankhy completed Ramses II's hypostyle hall with a new arrangement and number of columns and the hall was roofed with timber, probably open to the sky along the center. 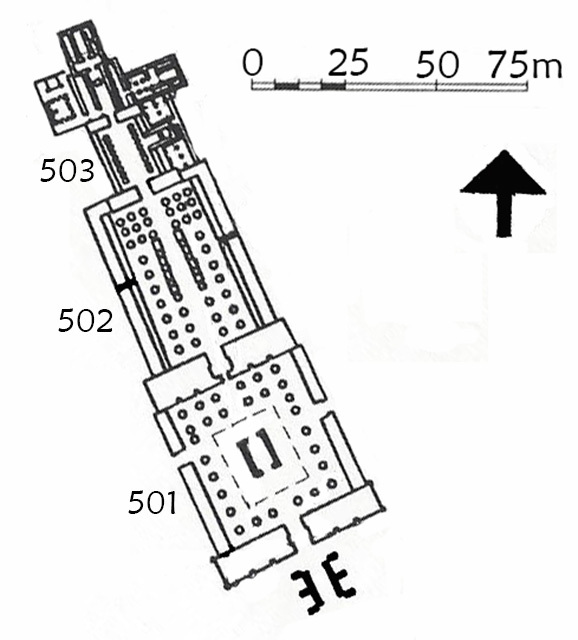 Before finishing the hypostyle hall pylon, Piankhy had already begun construction of an even larger court (B 501), fronted by a still larger pylon (this is B 500-Phase VII). 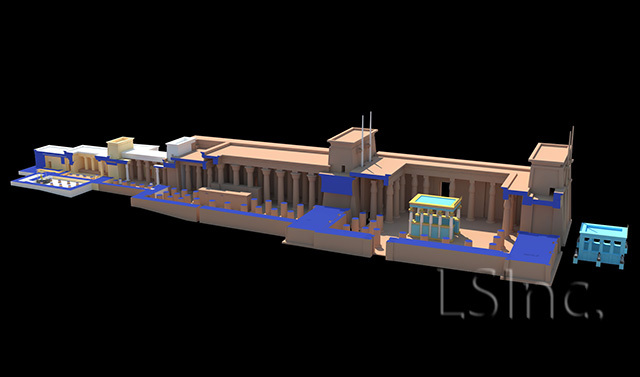 The temple's new total length became 156m (300 Egyptian royal cubits). Piankhy decorated his two great courts with reliefs illustrating the events of his Egyptian campaign of Year 20 (ca. 727 BCE), during which he conquered virtually all of Egypt. The events were further described on an enormous granite stele, set up in court B 501, which was recovered in 1862 and shipped to the Cairo Museum. The king embellished his new temple additions with statuary of Amenhotep III, brought from that king's temple at Soleb, nearly 500 km downstream, which included the six ram statues placed on pedestals in front of the B 500. Although three more phases in the history of B 500 can be understood from the remains, none entailed major rebuilding or expansion. Piankhy's son and third successor, Taharqa (690-664 BCE), further embellished B 500 by adding a magnificent stand in room B 506 for the god's sacred bark (or boat shrine). Taharqa's nephew Tanwetamani (ca. 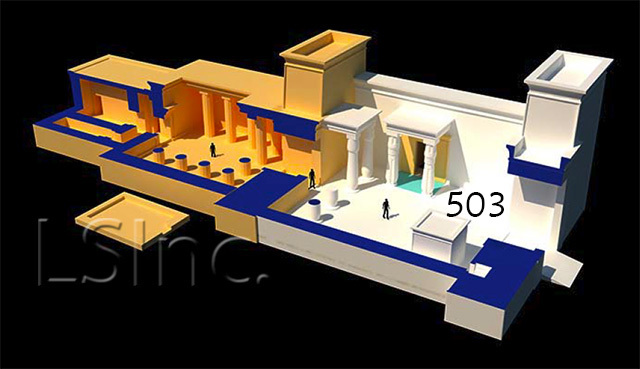 664-653 BCE) may have added a kiosk (or bark station) in the center of court B 502, as mentioned in ancient texts. 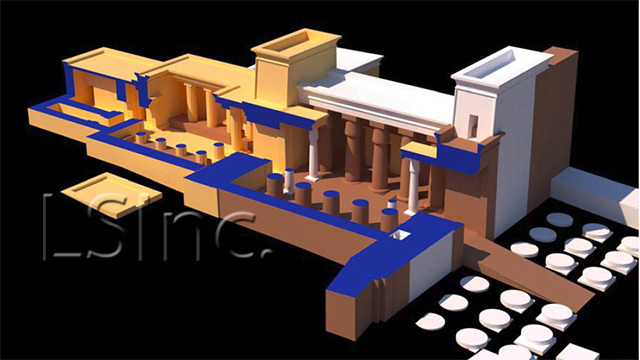 Piankhy's expansive temple was most likely severely damaged during Psamtik II's attack on Napata in 593 BCE. The temple was restored and re-roofed several times after that. The temple underwent major restoration for the last time during the joint reign of Natakamani and Amanitore (mid-first century CE), who refaced and re-carved the first and second pylons, added their own reliefs to its interior and exterior walls, replastered older reliefs, and built a new bark station kiosk in B 501. The temple remained an enduring symbol through the Meriotic period (from 250 BCE) and beyond.